When used on a modern stave the dots are either side of the 4th line, showing that note is F.
This is how the bass (or F) clef looks on the staff. The notes on the bass staff follow the same pattern as other notes on the music staff: E - G - B - D - F - A - C, the bottom line of the bass staff is a G. Click here for more information on this order of notes which, once learned, tells you both the lines and the spaces in the bass staff, and on the treble staff as well! In fact, it is well worth learning to read the entire grand staff in addition to the bass staff if you are learning to read music! Notes on the bass staff may be on a line or in a space. Click here for more information and examples of this. The notes in the spaces of the bass staff follow the pattern above as well, with an added bonus! The bass clef is also known as the F clef, and the note below the stave is F which makes it easy to remember. The spaces on the bass stave are F - A - C - E - G - B. 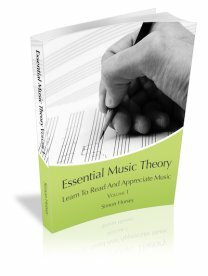 Test your knowledge with a free online music theory quiz! Click here to take a test on the notes of the bass staff. Remember, the more you practice reading the notes on the bass staff the better you will become at reading them. The key is to keep practicing reading the notes either by revising them yourself or by taking the quizzes on this site. Tip: If you know the bottom line and the bottom space of the staff, you can always work out the rest of the bass notes by going up using the pattern above!